Yesterday I spent the afternoon with an school friend, Yvonne Cox. It was so much fun hearing about the interesting projects she has done and movies she worked on. Movies like Rise of the Planet of the Apes and Red Riding Hood, plus effects like decapitated bodies, bags of heads and fake rabbits with hand-laid hair. 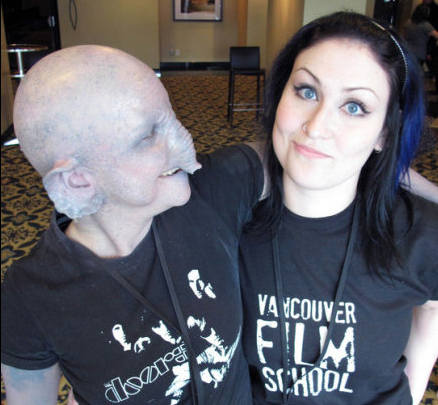 Back in 2009 we spent a year together at Vancouver Film School, in Canada, learning about makeup and special fx. While we were in school Yvonne did the most amazing beauty and prosthetic makeups. 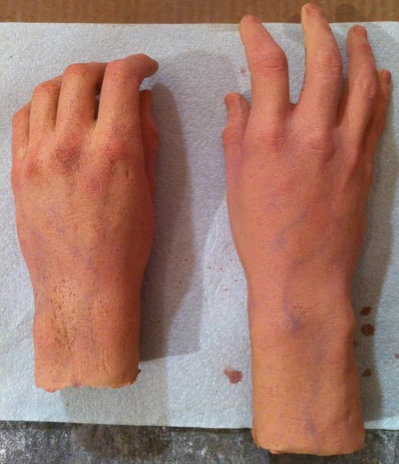 Since we graduated, the special fx Yvonne does are even more amazing, though not for faint of heart. There is a certain beauty in her work, even in the more gruesome stuff. What I like best about Yvonne is that she is always trying something new. Something that challenges her skills. She is so uber-talented, I wish I had half of her skills. Actually, I wish I had her eyes too. Most of all, I wish Yvonne lived here, in Los Angeles, near me. Even thought I am over a decade older than Yvonne, hanging out with her inspires me to keep learning, keep doing, keep creating and growing. To Yvonne: You are fabulous, I hope we get a chance to work on a project together soon. Let’s get together and find an excuse to do a few blood rigs! To all my readers: Yvonne just got a new Twitter account, @vonncox so you should give her a shout and follower her. 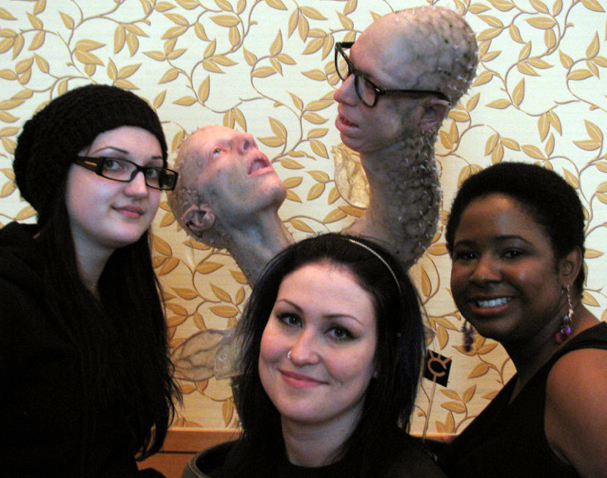 Back in the day with my classmates (L to R) Nikki, Yvonne and me at the 2011 IMATS in Vancouver, BC. We are posing in front of the fabrication we worked on during our mentorship at WCT Productions. Yvonne is Responsible for making and applying the webbed hands, teeth, and barnacle appliances. Thank you so much for the support Shari! You are so amazing and such a great person to be around. I am very happy to know you and I can’t wait for a future project we can do together! Even if it has to be over long distance! You have absolutely amazing work Shari and I am still talking about that mask you made in school, phenomenal!! Keep up the great work and I know you will be successful in the paths you choose! And thank you for making school so much freakin fun!!! I would love learn how you made the webbed fingers in your portfolio. Maybe we could do something as like “Webbed fingers how-to by Yvonne Cox” for a future post. I am sure that my readers would love to know how you work your magic.